Perhaps no individual in history better displayed the uniquely American outlook than Theodore Roosevelt, who was truly a man for all seasons. He was, of course, our 26th president – but he was so much more. In fact, when one considers the scope of his life it is almost unfathomable just how much Roosevelt managed to accomplish in only one lifetime. A Harvard-educated scholar, a North Dakota cattle rancher, a politician and civil servant on the state and national level, leader of the famed “Rough Riders” in the Spanish-American War, Governor of New York, noted conservationist who advocated the creation of the National Park System, Nobel Peace Prize winner, an adventurer who always sought new challenges and, of course, President of the United States. 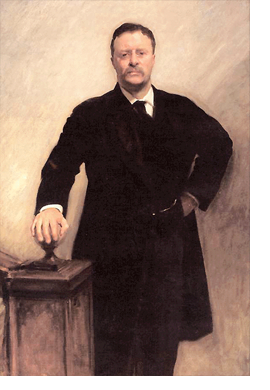 Theodore Roosevelt was also a Freemason. He joined the Fraternity as an already-established man at the age of forty-two in 1901, the year he began his service as President of the United States. As President he was known to visit Masonic Lodges during his travels across the country and the world. He broke ground for a Masonic Temple in Spokane, Washington in 1903 and attended the Masonic cornerstone laying of the House of Representatives building in 1906.